A site between Hunt's Bank and Deansgate, near the city's cathedral, has been "earmarked" after consultation with families, a spokesman said. 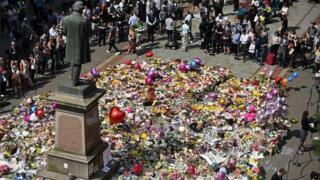 Prof Malcom Press of the Manchester Memorial Advisory Group said choosing a location was a "significant step". He added that the design had not been decided upon and would "not be rushed". The location was announced as plans for a "more intimate" commemoration of the second anniversary of the 22 May 2017 attack were revealed. Twelve months after the attack, a service at Manchester Cathedral, attended by Prince William and Prime Minister Theresa May, marked the first anniversary. The exact moment of the blast, 22:31, will once again see bells peal across the city centre and a smaller "personal and private event" for the families of the victims and the emergency services who responded will take place at St Ann's Church, the council spokesman said. Council leader Sir Richard Leese said those who were killed and injured, as well as their "loved ones... have a place in our hearts not just on the 22 May but every day". "Everyone's experience of the terrible events was different and we recognise and respect that others may wish to mark it in their own ways," he said. The council spokesman added that the city's cathedral would be open throughout the day on 22 May to all people to "spend some time in quiet reflection and prayer".